Where is Oakton? And, thank you. Interests:SCUBA diving, mountain biking, Landscape Architecture, my wife and boys. Right outside the Beltway near Vienna, Fairfax, & Reston. Still doesn't help me. The only Vienna I know is near Germany. I was there last year. I am in Long Island New York. A different state, a far baloon ride away. Paul you need to leave the island a little more often. MACNA in DC next year would be a good start. The North Fork has some great wineries, and I love Montauk. The Montauk Manor has a great view. 257 miles Southwest of Sayville, now I know exactly where you are. I have never been to MACNA but I have been to places I can't even pronounce and didn't even know existed. I think we should petition to have you come down and be a guest speaker. Paul, would live to meet you at MACNA this year, it's a sight to behold! I will also buy you a panera cookie, and bet you we can find you a good burger this way. I know of a few spots, but you can find a good burger joint anywhere. Maybe not the Middle East... But almost anywhere! I vote Paul makes a trip to DC to talk at MACNA.........Second? I will provide the cookie and burger...maybe even a beer....or two. I was a speaker already for WAMAS. I see that, but I was in between tanks at the time so I have not had the pleasure. When did you speak? They sell everything, but I would never buy a new one when I can take parts from old ones and build one myself. That is part of my hobby. I don't think I ever bought anything for the tank except the tank itself and some powerheads as I can't really build those. I was going to build the tank but my Mother N Law bought this one for me for my birthday in 1979. I don't speak about alkalinity because to me that is a no brainer. I put some baking soda in there every few days and that takes care of alkalinity and the drive way ice melter takes care of the calcium. No problems even though there is so much ink spent on the subject. 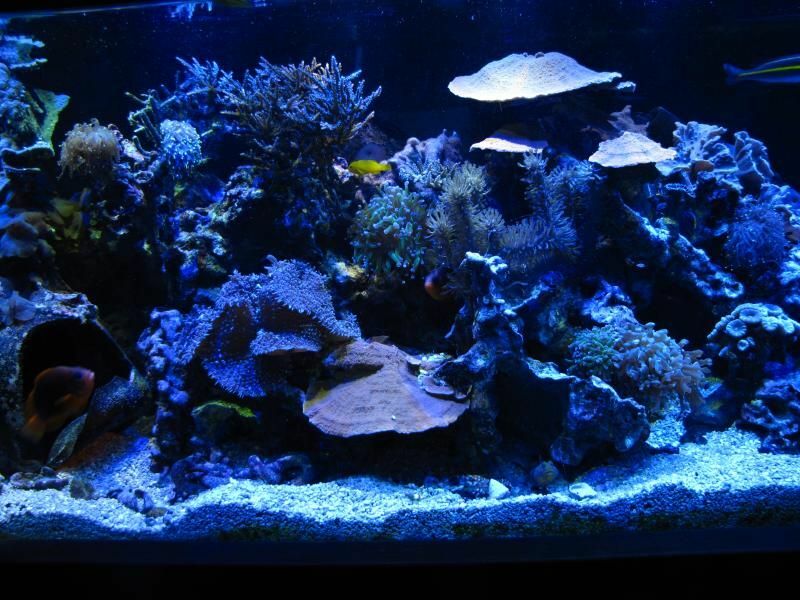 I don't let my corals read about parameters and they seem fine with it and always have. I fixed my ozonizer. I probably should not have tested it by putting the outlet hose in my nose but it is fixed. An instant headache proves that it works and the fact that I almost had to call the EMS with the paddles proves that it works great. Yesterday I fed my fish and I heard a big splash. My banana fish jumped into the algae trough, then back into the tank, then out of the tank on to my foot then on the floor. Then as I was trying to catch him he went left, I went left, he went right, I went right. I didn't have any music playing but I would swear he was doing the macarana. I finally caught him and threw him back in the tank. Now he is sitting there with a big smirk on his face and is eating like a pic as if this happens to him every day. He thinks he is a big shot now. He does look smug. 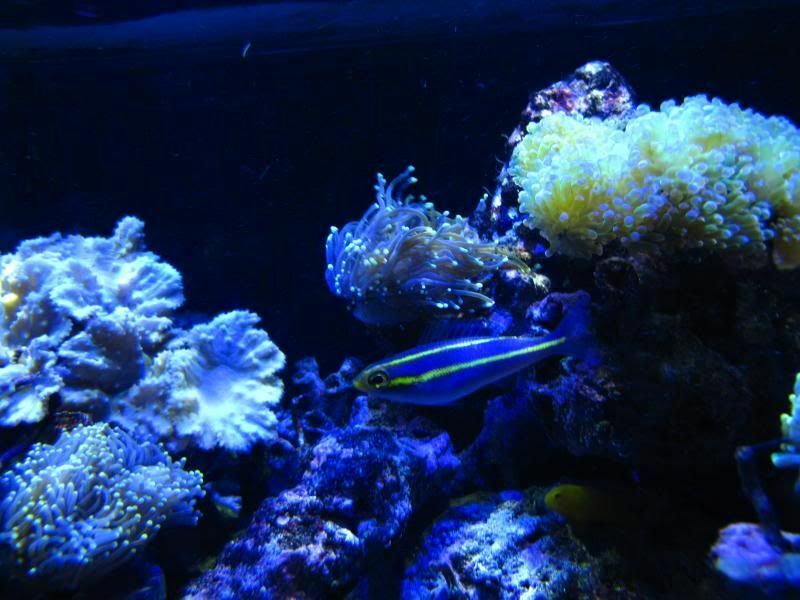 Your fish are starting to explore the outside of your tank recently! That fish is definitely not sissy. No water.....what is the problem? Here is a fire breathing fish that I also have a few of. This is the first time in decades that I don't have a Hippo Tang in my tank. I also don't have any percula clownfish. I just don't like percula's and have had to many of them. Besides my fireclown would chase it out of the tank. I do like hippo tangs but after a few years in my tank they always get HLLE and look like dirt. They live forever but always get that after 5 or 6 years. I gave up carbon a few years ago and that is one out of a hundred theories about what is the cause of HLLE so maybe the next time I go to a LFS I will get one. I now see loads of them as large as a guarter or smaller and I like to get fish as babies. I think hippo's, copperbands and moorish Idols are the three nicest looking fish there is. 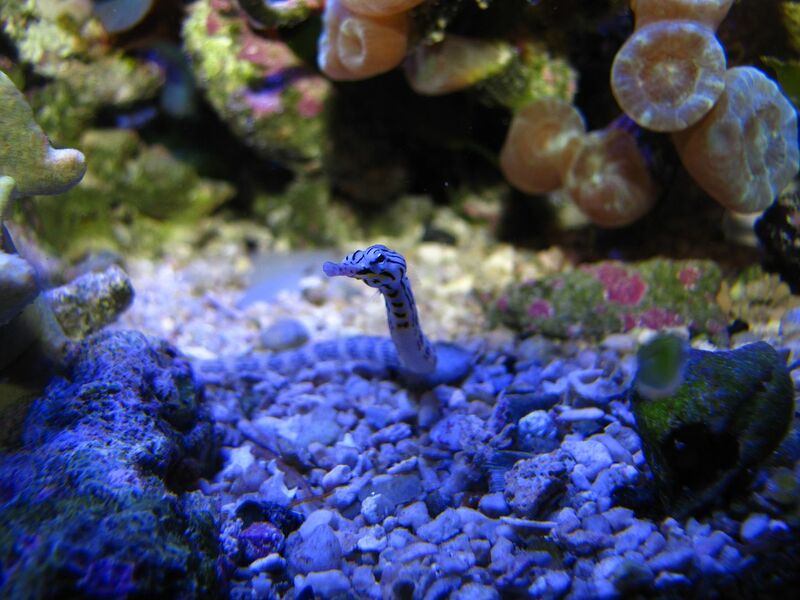 Lately I have been in a pipefish mode and have a few of those, Also for the last 15 years or so I have been going for more interesting, smaller fish. 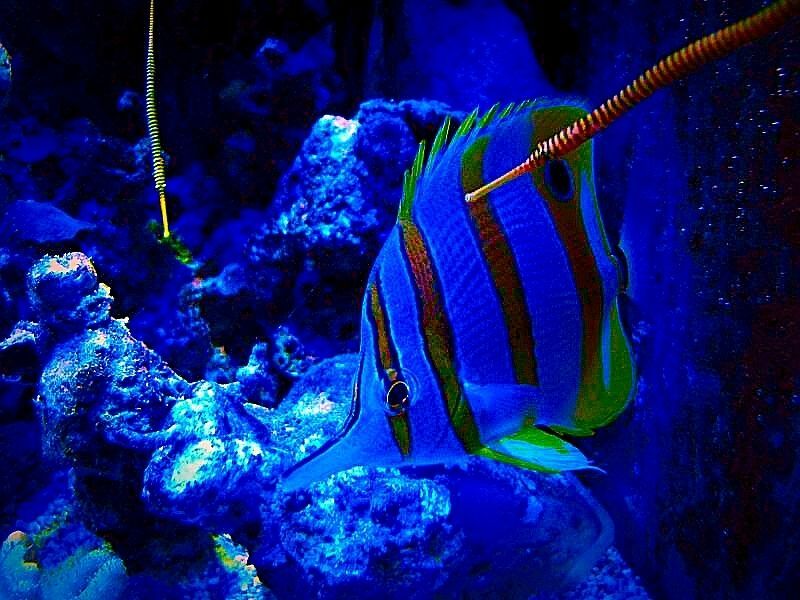 I don't particularly like tangs or angels (except for hippo's) If I see a shrimpfish, clingfish, lanternfish, or pinecone fish I have to have it but you rarely see those. Today I went to my favorite LFS to see if they got in a female dragon faced pipefish but no luck yet. I want to spawn mine and he looks depressed. On sunday they are supposed to get in 4 corythoichtys which are very cool but have a weird name. 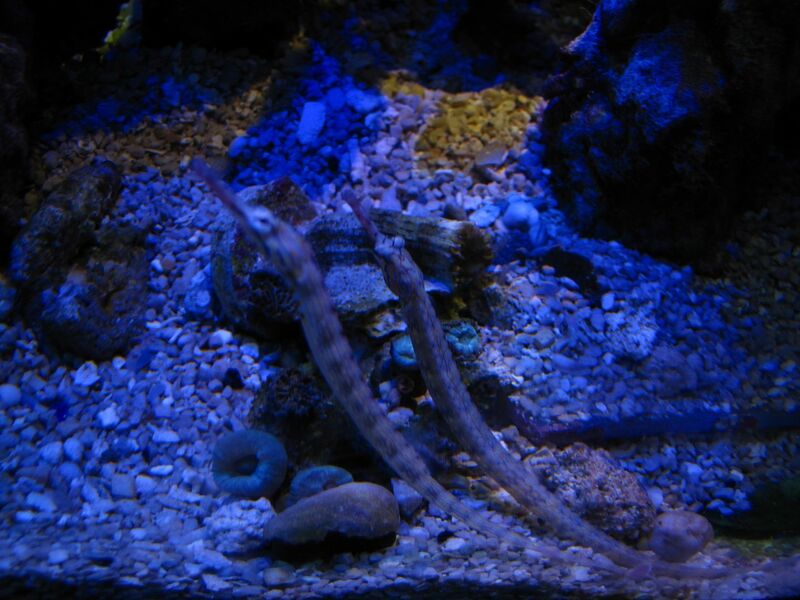 They are pipefish that look similar to dragon face pipefish so if they get in a pair, I will get them. 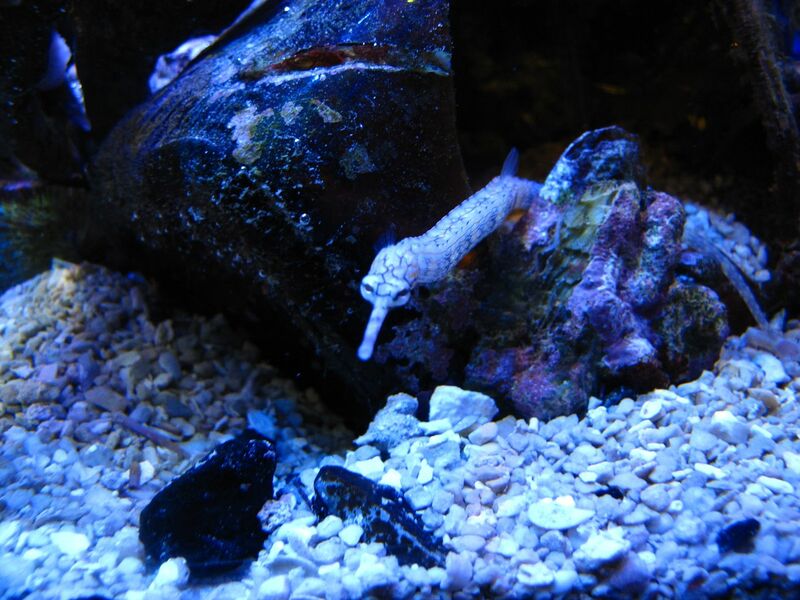 You need to buy pipefish right out of the shippers bags because if they go into the store's tank for a day, forget about it as stores never feed them. You need to hatch brine shrimp for that and in a store that ain't gonna happen. I think my blue stripes will breed soon and they are always my favorite. There was a pair of those at the LFS today but I can't put in 2 pairs as the males fight. The females just gossip and talk about stretch marks and cellulite. I added another dragon faced pipefish who immediately went over and hangs out with the other one. Hopefully they are different sexes as it is hard to tell with dragonface pipes but I bet they can tell. I think the females smell better but I can't be sure. I ramped up my brine shrimp hatchery because I have so many fish that eat them. My male mandarin stopped spawning because I can't hatch food fast enough for all these fish but I will double my production. Thank second picture looks like they may already be on a date! I couldn't resist. Today I got another pipefish, a multi banded and a ruby red dragonet. Sometimes you got to have what you got to have. It was probably a mistake because now I have spawning mandarins, two pairs of pipefish and a fifth pipefish along with two dragonets and they all eat just about nothing except new born brine shrimp. I doubled my hatching supply but may have to triple it. When I get time I need to build a much larger brine shrimp hatchery, the one I have can't take the volume as it was built a long time ago for one mandarin. I still have the hatchery/auto feeder for vacations which continousely hatches how many I want but it will only work well for a week or so. Now I still need a vacation feeder to feed live blackworms which is a little more difficult but not insurmountable. If I can make that, I would not need a tank sitter any more.